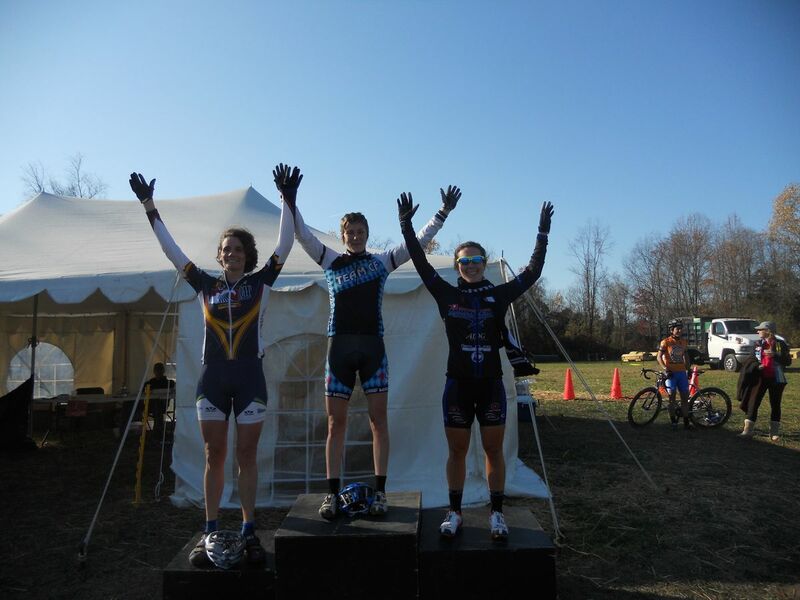 The Women's Podium: Kristin Gavin, Arley Kemmerer, and Katrina Dowidchuk. © Anne Rock. 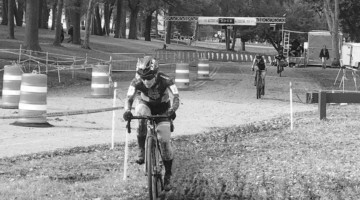 An archetypal East Coast fall day set the scene for MAC racers, who were treated to a technically challenging ’cross course that required vigilance for every off-camber twist and turn. Beautiful leaves and colorful kits turned the already idyllic scene at the Fair Hill Natural Resource Center, where equestriennes and cyclists compete year round, into something resembling Narnia. 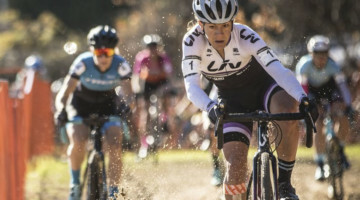 Team CF’s Kristin Gavin and C3’s Arley Kemmerer made an early break in the Women’s Elite race, and it looked like it they were untouchable. 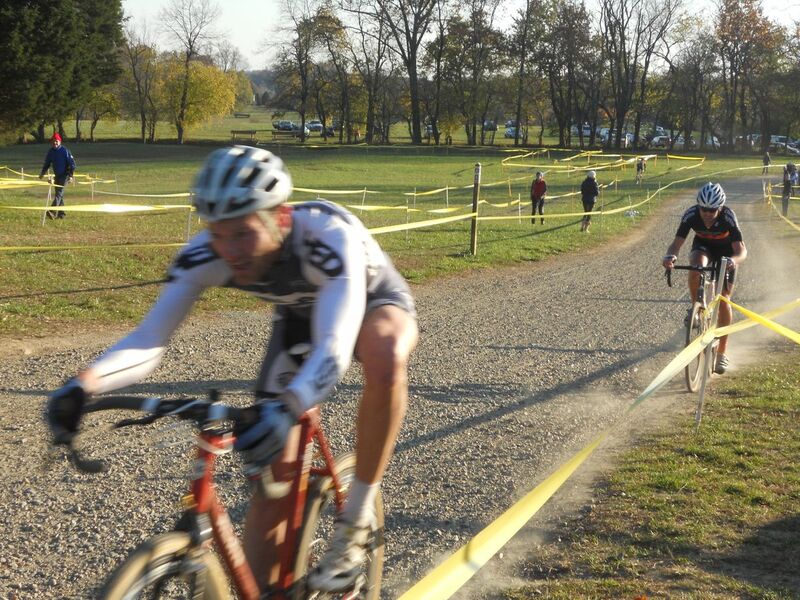 At lap three of the five-lap race, Gavin attacked on the long gravel road that served as the start/finish and created a gap that Kemmerer could not bridge. 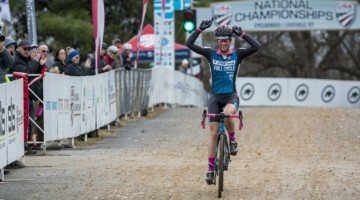 Katrina Dowidchuk (Team Deep Blue) chased down several riders to secure the third podium step. The real excitement proved to be the race for fifth. Gavin’s teammate Carolyn Popovic, apparently still operating on the New England race schedule (where races are set back an hour), was in the parking area when the whistle blew. After realizing it was her race, she rode like she was on fire to try and catch the group. The Men’s Elite race proved equally exciting. 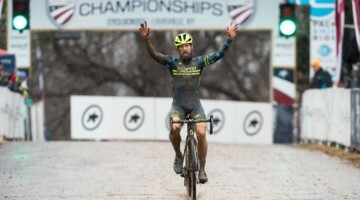 Weston Schempf (C3 Athletes Serving Athletes) delivered a superb ride, racing virtually unchallenged for the win. Canadian Mike Garrigan (Lapierre Canada) rode within sight of Schemp, and at times seemed to be gaining on him, but ultimately had to settle for second. With three laps to go, Schempf accelerated and increased his lead, ensuring no one would spoil his day. Jared Neiters (Haymarket) rallied for third behind Garrigan. 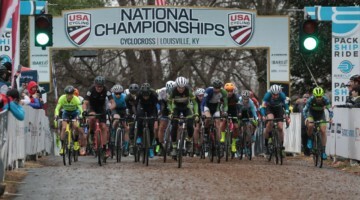 All three winners rode smoothly and aggressively, presenting a veritable textbook manual of how to race ’cross. 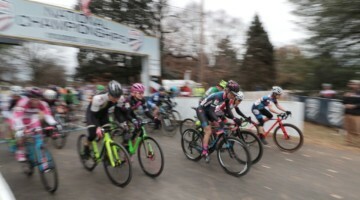 Shortly after the top finishers crossed the line, an intense battle for fourth erupted at the final barrier crossing near the final turn onto the finishing stretch. Greg Wittwer (ALAN N. America Cycling Team) attacked at the barriers, gaining a few bike lengths on his two competitors, including Olympian Bobby Lea. Wittwer, firing on all cylinders, had enough gas to hold off the track champion as the two sprinted for the finish.